In this chapter, we look at the core concepts of creating a VR experience using the Unreal Engine. We’ll take a quick look at how VR components are used across platforms, and then go straight into setting up an Oculus Go project right from the beginning. We will start with the prerequisites and initial setup followed by creating a project for testing different locomotion, teleportation, and object interaction concepts. After that we are going to build our scene using a pawn Blueprint with its components and event graphs, a level Blueprint for object interaction, and various material Blueprints to complete the scene. 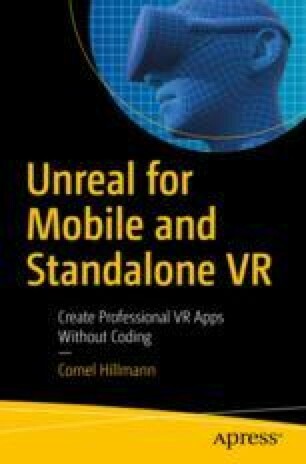 The basic concepts in this chapter are valid across all VR platforms and focus on the most common use cases for VR experiences.